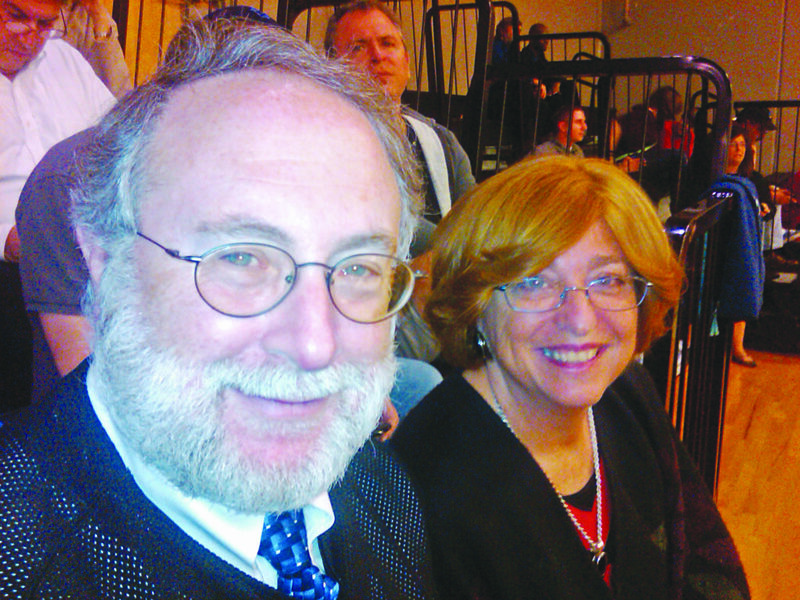 Rabbi Howard Wolk and Annette Wolk. Rabbi Wolk was recently named Rabbi Emeritus of Congregation Shaare Tefilla. Rabbi Howard Wolk, founding rabbi of Congregation Shaare Tefilla and JFS community chaplain, was recently named Rabbi Emeritus of the Modern Orthodox congregation. “In any community and any institution, it is critical to have such people, who can provide wisdom and insight both from their innate possession of these qualities, and from their years of experience. Here at Shaare Tefilla, we are blessed to have just such a person, in the form of Rabbi Howard Wolk. Rabbi Wolk has known and cared for four and sometimes even five generations of some of our families and he is a repository of our institutional and communal memory,” said Shaare Tefilla Rabbi Ariel Rackovsky, when he announced the appointment to the congregation on Shabbat, Dec. 22. Allan Cantor was the surprised recipient of the JWV Post’s prestigious Roland Gruenwald Award, given annually to an individual whose selfless dedication and service to JWV activities that benefit hospitalized and homeless veterans throughout the Greater Dallas area. The award was presented at the Post’s Installation of Officers luncheon held at the Aaron Family JCC Sunday, Jan. 27. Allan is a past Post commander; he currently serves as quartermaster for the Department of Texas, Arkansas, Louisiana & Oklahoma (TALO), as well as being JWV’s National Officer-of-the-Day. The Boy Scouts of America were founded Feb. 8, 1910. The Jewish connection to Scouting has been strong since its inception. One of the original three financial backers was a Jewish banker, Mortimer Schiff, also the fifth Boy Scouts of America president. His son, John, followed in his father’s footsteps and was the eighth BSA president. The Shabbat that falls on or after Feb. 8 each year is designated as Scout Shabbat. The Scout Law says that a “Scout is Reverent” and the Scouts of all ages promise to do their “Duty to God.” These values strengthen youth character in their family, community and faith. For the 2019 Scout Shabbat, area Scouts will celebrate with a Havdallah service at 7 p.m. Saturday, Feb. 9, in the Haymann Foyer of Congregation Anshai Torah, 5501 Parker Road in Plano. Kosher snacks will be available and Scout Shabbat patches will be given to all Scouts in uniform attending.